ross lovegrove is an award-winning english designer and visionary focused on developing innovative 21st century aesthetics through technology, biomimicry and materiality. taking influence from genesis and the organic form, london designer ross lovegrove has developed ‘future primitivism / instinctive overide’ for the biennale interieur 2012. to realize this advanced vehicle, lovegrove collaborated with an italian engineering laboratory, which consults with NASA to gain experience in reflecting the shape and technology behind the means of transport. through a series of sketches the silhouette of a rain drop and an outline of a car are merged together to create this hybrid structure. 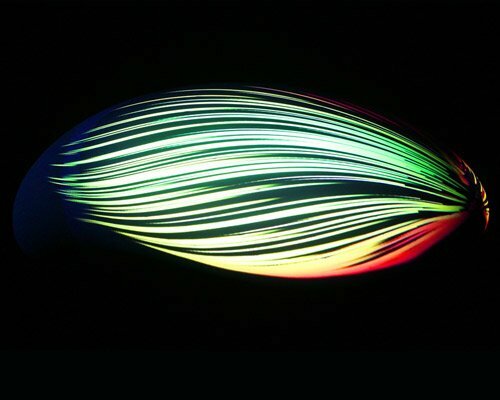 the aerodynamics of the instrument are projected on the surface through colorful beams of light to capture the horizontal movement and dialogue of speed and force. audio sounds of a car can be heard around the object giving a sensation that it is moving through air and space. visitors are able to walk around the four meter structure and watch as the video reflects a primordial evolution translated into a scientific endeavor. the biennale INTERIEUR 2012 has invited 7 artists, designers and architects to create a project room. curator lowie vermeersch explains the future primitives showcase which features nendo, makkink & bey, ross lovegrove, greg lynn, troika, david bowen and muller van severen. the biennale INTERIEUR is now in its 23rd edition and is internationally recognized as an not-to-be-missed overview of trends, tastes and cultural movements. INTERIEUR 2012 will be bigger and better than ever with an extensive programme and an exciting mix of culture and commerce. it will bring a curated selection of 300 international design brands to 90.000 expected visitors over a period of nine days, additional exhibitions are scheduled to be shown in the city-centre, and pop-up bars plus a restaurant will be installed beyond the halls of the fairgrounds. 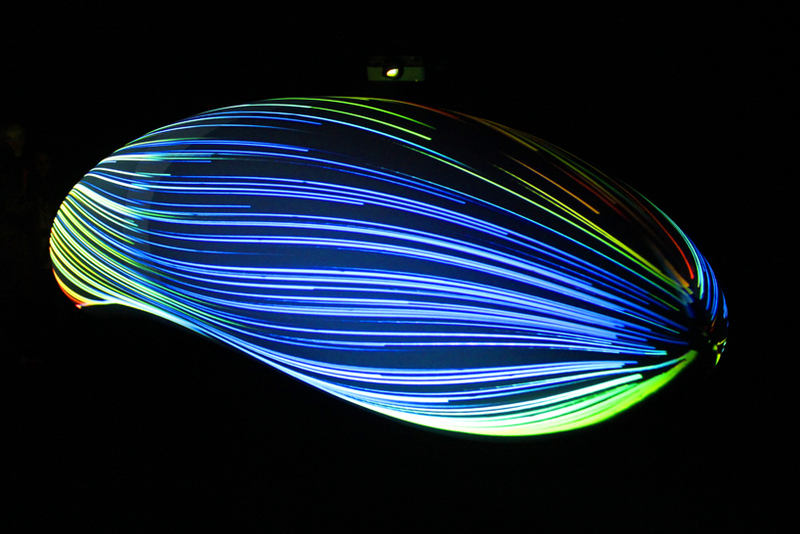 This thing is really nice and I love it but Ross Lovegrove just talks a lot of rubbish. Love the work you did, especially the forms which are formed with light effects. This is an amazing installation of which the sound track is a part. So why can’t we see it with out someone talking in the background? Yes, it is Ross Lovegrove, yes, what he is saying is really interesting, but why does he have to talk through the video of the piece itself?